It was not until about the mid 1990’s when it became apparent that gum infections and severe tooth decay could cause inflammation in the blood measurable by using the CRP marker (C-reactive protein). As this link shows Dr. Joseph Muhlestein at the University of Utah demonstrated in 1996 that chronic gum infection could cause a heart attack. He isolated the bacterium Chlamydia pneumoniae in 79% of patients undergoing coronary bypass surgery, while samples from heart transplant patients isolated this bacterium in only about 5%. The new thinking was that bugs that multiply in diseased gums could migrate into the blood and cause platelets from the blood to clump together and block coronary arteries causing heart attacks. Harvard University researchers have confirmed this. In the past it was known that a bad tonsillitis with an aggressive bacterium, Streptococcus viridans, could cause subacute endocarditis, a dangerous infectious disease of the heart valves, which can be responsible for sudden death in younger persons. 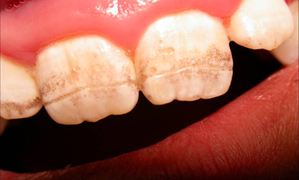 Neglected cavities in teeth can also harbor this bacterium. 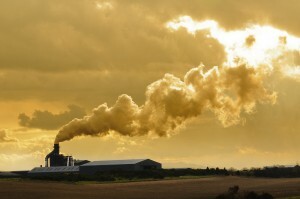 Another study in 2009 showed that two particular strains of bacteria in infected gums, Tannerella forsynthesis and Preventella intermedia, were associated with an increased risk for heart attacks; but it was more the overall burden of bacteria in the infected gums than the specific bacteria strains that mattered most. With this background it is easier to understand that we need to take good care of our teeth and gums, if we want to maintain good health. As a start most people should see their dental hygienist (who usually works in a dentist’s office) twice a year. The dental hygienist will probe the depth of gingival pockets with a periodontal probe. A normal depth measures up to and including 3 mm. Deeper pockets than that usually indicate that the patient did not floss regularly. One needs to floss at least once per day, better twice per day and it should not bleed after flossing (initially when a person flosses for the first time the gums tend to bleed a bit). The hygienist will do scaling of plaques on the tooth enamel. Any cavity that is detected will be brought to the attention of the dentist. At the end of the scaling procedure fluoride is applied, which puts a coating on the tooth surfaces to prevent tooth decay. When deeper pockets (6 mm or more) are detected a trial of subgingival root brushings has shown to have a very beneficial result within only 14 days. Periodontal pockets were improved and bacterial counts of periodontal infections were shown to have improved as well. It has been accepted for quite some time that a combination of brushing and flossing are the best methods to control dental plaque, which is the precursor for cavities. In order to test the knowledge of adults in families with small children these authors from the School of Public Health of the Maryland University investigated Maryland’s adult population knowledge regarding caries prevention. It turns out that there were deficiencies in knowledge about the prevention of dental caries and the importance of fluoride to create strong, decay resistant enamel. A randomized, prospective study is planned in Hong Kong which will start teaching oral hygiene to kindergarten children aged 3 and will be reinforced several times later to instill good dental hygiene behaviors into these children’s health routine as outlined in this link. Not only is it important to teach brushing and flossing, but also food habits with cutting down on sugary and starchy snacks as these foods make the saliva acidy promoting caries producing bacteria in the plaque. This English study shows that a primary school based caries prevention program reduced caries by 35% when sugar intake was limited in the interventional group and brushing of teeth was done twice per day along with flossing. An addition to flossing for those with narrow tooth intervals or those with braces is a waterpik system. This can be used to clean food residues from the spaces between your teeth and from gum pockets. Flossing once or twice per day is still needed to remove plaque to avoid tartar build-up. Before bedtime it is advisable to floss first, then use a waterpik, then use your electric toothbrush with a fluoridated toothpaste. During the day use the waterpik after meals followed by brushing with an electric toothbrush with non-fluoridated toothpaste. Water Picks are also called “water flossers”; they are easier on your gums. Xylitol is a natural sweetener originally derived from birch. Sugarless gum often is sweetened with Xylitol. This study has shown that chewing Xylitol containing gum can effectively reduce caries. This paper describes that the increased saliva production from chewing gum provides a slightly alkaline environment for teeth. This helps to clear out sugar faster from the oral cavity after a meal, inhibits bacterial growth, neutralizes the pH in plaque that is on the acidy side after sugar consumption. The authors concluded that chewing Xylitol gum is a useful addition to the other known preventative measures of dental decay prevention, such as brushing and flossing teeth. The techniques the dentist is using to treat plaque and dental decay have been refined by a new technique describe in this Australian publication as a minimum intervention caries prevention program. The four methods used in minimum intervention dentistry are described here. 1. Recognition: to recognize potential caries factors early through lifestyle factor analysis and saliva testing. 2. Reduction: alter the diet and lifestyles to increase the pH of the saliva, which will reduce the risk factors for caries. 3. Regeneration: to arrest and reverse minimum lesions at the earliest stage. Use agents such as fluorides and casein phosphopeptides-amorphous calcium phosphates to achieve this. 4. Repair: when a cavity is present, a technique of “conservative caries removal” involves using bioactive materials to allow healing of the dentine layer of the tooth. I already mentioned above that alkalization of saliva by chewing Xylitol gum could significantly help prevent tooth decay. It does so by raising the pH, while chewing on sugary foods or starchy foods lowers the pH (making it more acidy). Growth of caries producing bacteria, which are called “cariogenic bacteria” is stimulated by acidy saliva and inhibited by alkaline saliva. For this reason people whose diet consists of a lot of vegetables and greens will have more alkaline saliva and are less prone to develop cavities. The worst foods to get cavities are sugar in its many disguises and starchy products (candies, bread, rice, potatoes, pasta, bagels, cookies, cakes). What can cause bacteria from the mouth to appear in the blood? One common condition is periodontitis, which is a chronic inflammatory condition of pockets of the gums around the teeth. This originates from neglecting your teeth and not flossing. Smokers are more afflicted by this as well. Dental procedures called scaling and root planing are often done for chronic periodontitis. This study from January 2013 shows that there is about the same amount of bacteria that leak into the blood following these procedures when compared to flossing. Sometimes a dentist will recommend using a short-term antibiotic to reduce the leakage of bacteria into the blood, particularly with people who have heart valve problems or had porcine heart valve replacement in the past. This publication from 2009 also describes that dental flossing causes bacteria to be shed into the blood (bacteremia). Dental self-care should be taught to children at an early age to educate them to brush their teeth twice a day and floss them at least once per day. At the same time they need education what causes cavities in terms of food intake and that fluoride can help make teeth more cavity resistant. They should avoid sugar in pop, candies and cookies etc. Parents best teach by example! Regular visits to the dentist’s office will safe money on the long term. Regular scaling by a dental hygienist every 6-month will remove plaque from which cavities develop when bacteria thrive in them and produce acids that affects the enamel. 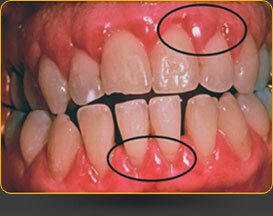 Minimum intervention dentistry discussed above (4 methods used) can prevent your teeth from decaying. Regular flossing will keep your gums healthy and reduce the colonization of the mouth with bad, cariogenic bacteria. With all this in place you likely will keep your teeth for a long time and not need dentures or tooth implants because of lost teeth. At the same time you will prevent your immune system being overwhelmed by mouth bacteria, which could have lead to a heart attack had you neglected your teeth. As mentioned in the beginning, a CRP blood test is a useful tool to rule out chronic infection. When people think of hazards to dental health, the first thought will be about tooth decay, lack of brushing and flossing and eating candies and other sugar-laden foods. Periodontal disease is often neglected, and yet it is just as threatening to teeth and gums. Destructive periodontal disease will lead to loss of the supporting tissues of the teeth and as a result, there will be loose or shifting teeth and ultimately tooth loss. Generally these findings were seen in older population groups. It was thought that the disease would rarely occur in patients younger than 35 years of age and the theory was that dental plaque was the likely cause. Lifestyle choices were not thought to play a large role. Recent findings told a different story. A cohort study consisting of 903 participants examined self-reported tobacco and marijuana smoking and dental examinations were also done. The authors of the study found that tobacco smoking as well as cannabis (marijuana) smoking was linked with a higher incidence of destructive periodontal disease before the age of 32 years. In comparison to this dental plaque was not contributing to a higher incidence of periodontal disease in this younger age group. Another risk for destructive periodontal disease in the youngest age group (as young as 12 to 18 years of age) was impaired glucose intolerance (a condition leading to diabetes). Due to those findings it is obvious that brushing and flossing are not the only weapons against periodontal disease. Healthy eating habits and cessation of smoking are equally important for dental health. This is particularly important as heart disease, which is also an inflammatory condition is closely linked to inflammatory disease of the gums and you likely have heard that heart attacks can be prevented by brushing and flossing teeth. Celiac disease is a condition, where a person is unable to tolerate wheat products. In other words they have a wheat allergy. It is not enough to avoid the standard foods like bread and other bakery goods that contain wheat. Wheat makes its appearance in many foods and also in taste enhancers like monosodium glutamate. Alone for this reason it is important for a person with celiac disease to carefully read labels in order to avoid foods that contain gluten, which is the offending substance. Often celiac disease goes undetected for many years, but there are early signs that can help to take action sooner rather than later. Dr.T.Malahias, D.D.S., a dentist from Groton, Conn presented his findings at a recent international symposium for celiac disease. He pointed out that there are signs that are visible in the dental enamel, which will already be present in childhood, once the permanent teeth appear at about age 6. The bilateral symmetrical markings are defects in the tooth enamel. they can be brownish, yellow or white and are most commonly seen on the central incisors. They give the tooth a mottled, non-shiny appearance. Patients with this appearance may also have problems with the delayed eruption of the permanent teeth. These markings are permanent, and even after following a gluten-free diet they will stay, as the development of the enamel started already in the third or fourth month of life. While there may be other reasons for this abnormality, celiac disease should be considered in the context of the patient’s history. The results are quite significant in pediatric groups: in patients less than 12 years of age who had celiac disease the rate of enamel defects ran at 90% as compared to 44% of the others without celiac disease. People who have recurrent unexplained aphthous ulcers should take notice too. Five percent have been found to have undiagnosed celiac disease as a result of the constant and chronic overstimulation of the immune system by gluten substances. Once celiac patients start with a gluten-free diet, the ulcers will occur less frequently. Missing teeth are often just ignored -why bother? There are still all the others around to assume the necessary functions! The truth is different: missing teeth can affect us in the way we eat, speak, rest, and appear. They can influence our behavior and overall functioning. A missing tooth can also compromise the dental health of its neighbor. In the past the only options for missing teeth was either dental bridges or dentures. Bridges and dentures still have their place now, but the benefits for dental implants are significant. -They help to preserve remaining natural bone structure. -They reduce the need to cut out adjacent teeth for a bridge. -They eliminate the need for removable partials or dentures and the sores that may go along with them. -The roof of the mouth does not need to be covered by removable partials or complete dentures. -They look, feel and work just like natural teeth. -They support face shape, smile and provide confidence when eating and speaking. -A few exceptions apply: people who smoke and people who have diabetes, particularly when uncontrolled and severe, have much less success with implants, as healing is impaired. However, you may consider quitting smoking and diabetes may be able to be controlled better with the help of a specialist. Other patients who have pacemakers, artificial heart valve replacements or other implanted devices may have to stay away from implants and they may have to stick to more conventional methods such as bridges and dentures. The dentist will do a thorough examination to decide, whether you are a candidate for dental implants. Each tooth will be examined and a medical and dental history will be taken. Special x-rays (panoramic and tomograms) are needed to determine whether there is enough bone available. This helps to decide whether the implants can be placed directly, or whether grafting more bone will be necessary. This step is very important. It also helps the dentist to identify important structures, like nerves, sinuses and adjacent tooth roots. You will discuss all the treatment options with your dentist, which also helps to clarify expectations about the final results. This comprehensive treatment plan can be compared to building the foundation of a house. The foundation has to be solid, so the final structure holds up. A properly done dental implant should be a one-time job. The procedure itself is done in the dental office or in a surgical suite under a local anesthetic, and over-the-counter pain medication may be needed after the surgery. The time it takes to heal can be variable. It may take up to six months, but it is important that healthy bone develop around your implant, which is the strong bond that is needed to hold the implant in place. Once the healing is complete, your dentist takes a final impression, which is needed by the dental laboratory to create the permanent teeth. 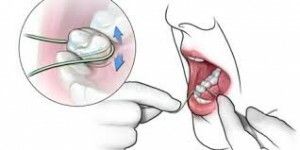 Once the permanent teeth are placed you will receive care and a dental hygienist will instruct you in dental hygiene. Special plastic cleaning instruments are used to avoid scratching the titanium surface of the implant. Just as with natural teeth, implant-retained teeth need to be cleaned daily and need to be regularly checked by a dentist. Looking at the overall picture it is clear, that the dental health and function of our teeth closely relates to every facet of our overall health, from speech to the function of our digestive tract and proper nutritional status, which affects cardiovascular health as well. 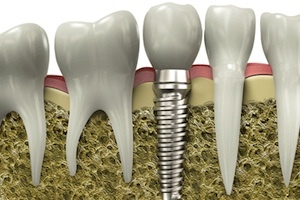 A tooth implant involves a lot of detail work and effort, but its benefits are far reaching.